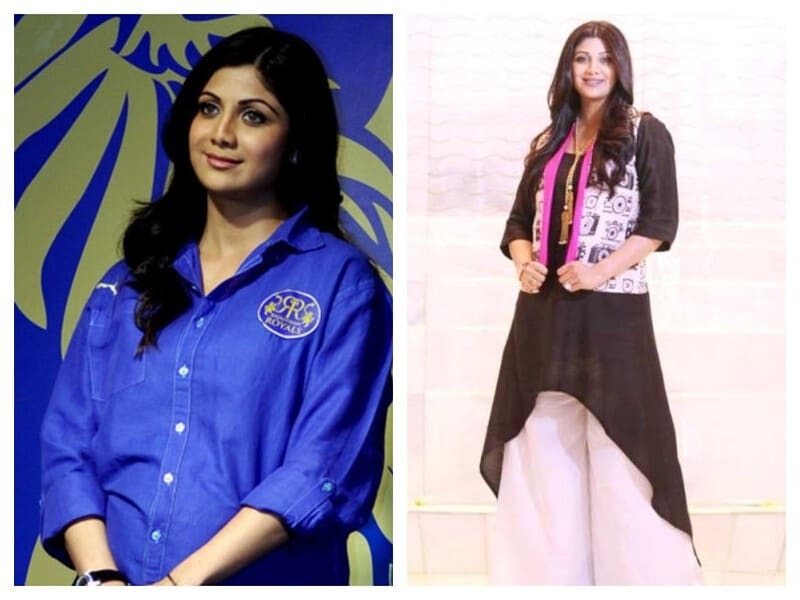 Shilpa Shetty is one of those beautiful celebrities who get more prettier as they age. Throughout the period from Baazigar to Nach Baliye, there has been a drastic change in her appearance. Some credit may be given to her genes, but she also devotes enormous time and energy to stay fit and in shape. Shilpa says “It’s not fair to say it’s only because of my genes. Yes, I do have my father’s athletic genes and a good metabolism, but this weight loss is mostly due to my effort,” says the actress, dance show judge and entrepreneur. Shilpa has been married to British businessman Raj Kundra since 2009. The gorgeous actress gave birth to her son Viaan in 2012. She put on more weight of about eighty pounds by the time of her delivery. Shilpa states her high fat diet which included ghee, milk, and other fatty products are responsible for her huge weight gain. “I ate things made with ghee and drank whole milk. Like most mothers, my attitude was old school– baby comes first” , she said. Shilpa did not hurry immediately after delivery, but she waited for four and a half months to switch to workouts. As she was not accustomed to hefty body she was facing difficulty in sitting and bending and it is for that reason she started work outs rather than to get into striking shape. Shilpa began to do light workouts such as cycling, walking etc. for fifteen to twenty minutes thrice in a week, under the guidance of her fitness trainer Vinod Channa. She gradually increased the intensity and time spent on the workouts. Consequently, she was able to lose 20 kgs within ten months post delivery and she is back into her slender shape. While being a nursing mother, she consumed 2200 calories in a day which were comprised of low carb, high-protein, and high fat food items. Shilpa takes care to consume 1800 Calories in a day. She begins the day with a glass of amla juice or aloe vera juice. She makes sure that the carbohydrates she takes in have low glycemic index. She avoids white carbs and takes brown carbs such as brown rice, brown pasta, brown sugar, brown bread etc. in her diet. Shilpa uses olive oil to cook wholesome foods such as salmon, turkey, veggies etc. After having strenuous workout session, Shilpa consumes protein shake, eight black raisins, and two dates. She follows strict diet for six days and one day a week she enjoys her craving for her favorite foods. She completely avoids snacks in between the meals as she believes that snacks will add up more calories. “I start my day with a glass of amla juice and a plate of papaya. It clears my system and is good for the skin. After half an hour I have two whole eggs – omelette, boiled or scrambled. The yolk is full of vitamin A, D, E and K. Between lunch and breakfast, I drink a glass of tender coconut water. I have cut down my rice intake from a large bowl to a small bowl, and instead of four rotis I eat two. My lunch consists of brown rice or two quinoa rotis, a daal, fish, a green vegetable and egg burji. An hour or two after lunch, I drink a glass of slim dahi buttermilk. I have tea in the evening with brown sugar, walnuts and cashew, a slice of cheese and Ryvita crisps. For dinner, I eat a lettuce salad filled with veggies, a turkey slice and olive oil. If not that, I eat a salmon steak and sour soup,” Shilpa shares her diet secrets. Shilpa practices all kinds of workouts to sculpt her body right from cardio to strength training to yogan or any kind of workout. She does the workouts for five days in a week in which she allocates two days to practice yoga, two days for strength training exercises, one day for cardio exercises. She further divided her strength training workouts into upper and lower body workouts. Instead of relying on light weights, she prefers heavy weights for strength training to shape up her muscles. She also meditates for ten minutes after yoga to wash out stress. She swears a lot by yoga and believes that practicing yoga regularly is one main reason for her slender body, fitness and a stress free mind. Almond milk – Almond milk being free from sugar, gluten, dairy, soy, and other artificial ingredients nourish you with Vitamin B12, calcium, vitamin D, dairy milk. Raw nut butters – Besides being free from sugar, raw nut butters contain nutrient packed nuts. You can eat the processed food without being worried about the circumference of your waist. Organic Coffee – Credited with magnesium, vitamin B, liver detox properties, and brain stimulants, organic coffee can be consumed twice in a day. Flax Meal – Apart from being easy to cook, flax meal has yum taste. Dense in omega-3 fatty acids, proteins, and fiber, the food item provides you adequate nourishment. Mustard – Mustard which is widely used condiment perk up the taste of your meals without having you gain weight. However, since myriad varieties of it are available in the market, pick those having no added sugar, sodium, and preservatives. Besides controlling your hunger, mustard also fires up your digestion.